Avid hikers and mountaineers will have to begin thinking twice before climbing the largest mountain in the world. 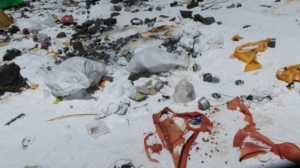 Not just because Mount Everest has an elevation above 29,029 ft (8,848 meters) and temperatures go much below zero degrees, but past climbers have been leaving garbage in measurements of tons on base camps and routes. The issue does not simply lie within the climbers, but also with the lodgers around the mountain who burn toxic pits of garbage. Proper methods of recycling or disposing of waste are not deemed financially viable or are ignored. Organizations are currently grouping together to combat the waste issues. Individuals can also learn and practice what to do to hike sustainably. Mount Everest is located at the border of Nepal and China, where the mountain is shared among the two countries. It is part of the Himalayan mountain range that extends to around 1500 miles (2,400 kilometers) from Afghanistan to Bhutan. The mountain is estimated to be around 60 millions years old. A mountaineer spends an average of two months hiking to the top of Mount Everest. It takes an average of 40 days for the human body to adjust to its high altitudes and freezing temperatures. These mountaineers carry with them fluorescent tents, climbing equipment, gas canisters, oxygen tanks, eating utensils, and other camping equipment, which they leave behind throughout their excursion. Random piles of trash are left along trails and camp bases. Even bags filled with human feces have been left behind, with an estimate of 12,000 pounds sitting on those steep, frozen slopes. But the issue does not stop there. Lodgers at the base of the mountain burn pits of trash that can be as large as 270 square feet to 2,150 square feet. The trash includes plastic, beer cans, glass bottles, paper products, etc. Burning these pits of garbage have negative side effects. Poisonous gas gets released into the air and chemicals seep into the water once buried. The Lodge owners avoid recycling because it is too much of an expense. Steps are being taken to control the waste issues at Mount Everest. 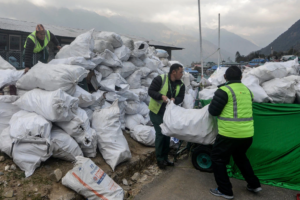 The Sagarmatha Pollution Control Committee (SPCC), a nonprofit organization that manages the Khumbu region, and locals are currently maintaining the routes. They have also installed 70 trash containers and go door-to-door for garbage collection. The Nepal government’s tourism ministry has declared that climbers of Mount Everest must return with an extra 18 pounds of garbage after their journey. Organizations of all kinds have been campaigning and working together to get Mount Everest Clean. Organizers and volunteers have also campaigned back in early 2018 to transport 200,00 pounds of trash. 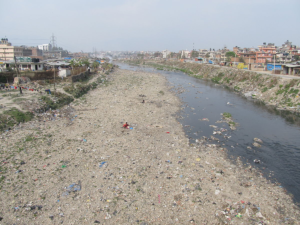 One organization, the Mount Everest Biogas Project, aims to collect garbage from a village known as Gorek Shep, where they will recycle the human waste using an anaerobic digester system that uses bacteria and a water mixture that would break it down with a sustainable process. Another organization, Sagarthmatha Next, collects trash from villages to create art. The SPCC has a list of rules titled, “Waste Management Rules for climbers and expedition groups in Khumbu”. This is found on their website under ‘Our Works’. It requires mountaineers to visit their office before heading towards the base camps. Visitors must follow rules such as dividing garbage, proper collection of human feces, not painting on the rock, and more. 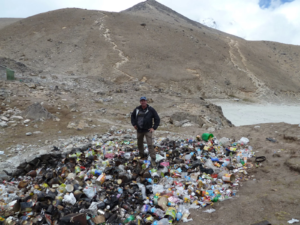 Their rules appear to confront many of the prevalent waste issues known to plague Mount Everest. Hopefully, these rules will maintain and prevent further damage of Mount Everest’s environment and people will become more respectful towards the beautiful, giant natural wonder. Everest region at the airport in Lukla, Nepal.